For some reason when thinking about six on Saturday this week, Elton Johns song Saturday night just appeared in my head, no idea why, it’s strange how the brain works at time. Anyway after the snow and the rain, it’s been nice to have a dryish week, well if you discount the rain Thursday morning and other showers overnight, oh and there was the April like showers that drenched me Friday morning while pruning a rambling rose. Talking about Friday, I had one of those bird of prey days when I managed to see five in day, started off with a peregrine falcon over Salisbury, before seeing a red kite and Kesteral while driving to my next job, then watched buzzards pairing up, doing their mating displays of twisting and turning in the air and fighting off other males and finished off with a sparrow hawk chasing a blackbird over the garden, all wonderful sights unless you are are the blackbird! Everything is slowly growing away now and I am frantically trying to finish off my pruning before it all comes into leaf and starts growing away although I think the mini beast from the east is due this weekend, bringing more snow and cold temperatures, so that will slow it all down! Pulmonaria offinicalis, how on Earth can someone not like this plant, it gives us its lovely spotted leaves and beautiful spotted leaves harbouring in the spring. The little flowers are a mix of different shades of blue, with pink mixed in, how lovely does this shade lovely plant look! 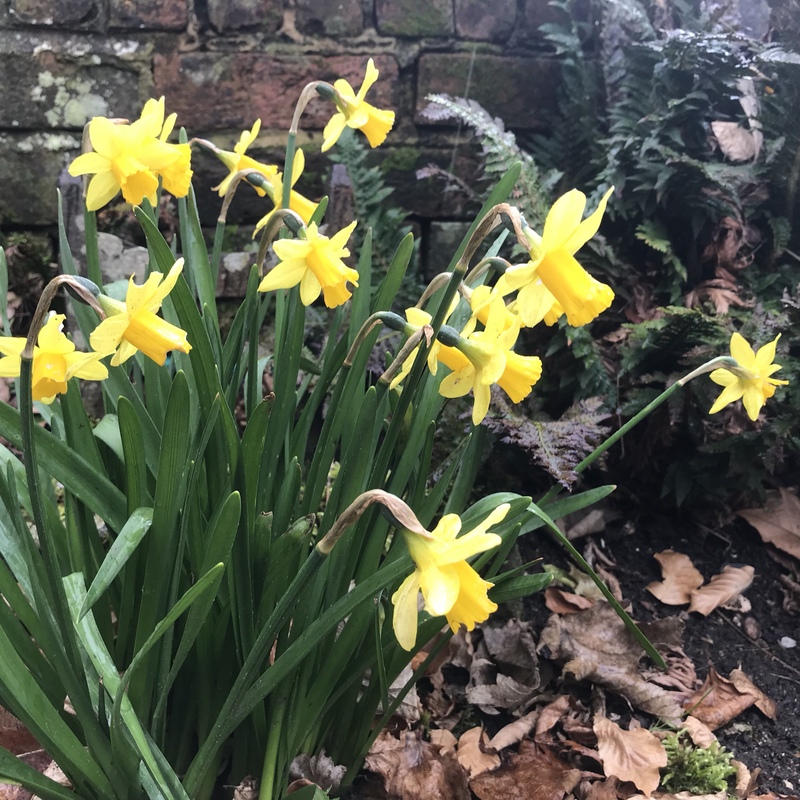 I love small daffodils like tete a tete here, I find them so useful in the smaller garden, there they just look more in scale than the bigger ones and there foliage when dying back can be a little unsightly while these little ones can be hidden by other plants coming though. I agree with all your wise words, Thomas! Good old rhubarb with everything. At least it keeps you moving 😉 ! Daphne is a real winter giver, especially to the nose. Mine have now been in flower for four months and still have some unbroken buds. Haven’t noticed any aquilegias growing up yet but when they start, I’ll be asking myself whether I have eradicated Nora Barlow at last. Lol indeed it doe#, just love that taste. Nice rhubarb! Mine is still under ground… a later one maybe. I totally agree with you about pulmonaria: they are lovely ! I’m with you with rhubarb, pulmonaria and aquilegia foliage. I would grow aquilegia for foliage alone, I think. Your pulmnaria looks further along than mine; mine was almost not worth photographing, and I seem to have lost my ‘Raspberry Splash’ which is very similar to rubra. Loved your birds of prey story. We get eagles and Cooper’s hawks here and it’s always exciting to spot one. The other birds in our garden are lovely, too: most recently Northern Flickers. You’re going to have an awesome amount of rhubarb! Yes, the Cooper’s Hawks have actually been making a comeback here. Loss of habitat and pesticides in food chain, I think. There’s been a lot of logging on Vancouver Island. It’s still beautiful. They left a fringe of trees along the roads and shores, so you only see the extent of it from the air. Also, there are many areas that are too steep to log. Within Greater Victoria, the Garry Oaks are protected and that provides habitats for birds and native plants. I’m with you on the Pulmonaria, tête-à-têtes and daphne – three of my spring favourites! Another reader impressed w/your birds of prey. It’s a wonder you got any work done. Thanks – while reading your blog all I got in my head was ‘Saturday, Saturday’ think it’s called an ear worm 😀 I’ve got the offer of a share of an allotment so I will give rhubarb a go never grown it before but it’s never too late. I love rhubarb! Mines cosy under a planter and thank goodness because I have woken to 6 inches of snow again in Wiltshire! I hope all you garden is ok in this cold weather. You’re quite right about Pulmonaria. I had ‘Blue Ensign’ for years but it expired. I have a big clump of a mediocre form of Comfrey; Pulmonaria would be much better.